Your author's favourite seasonal traditions are generally those with obscure purpose and confusing content, and as such a trip to the Cotswold town of Painswick on Sunday 24th September offered a perfect afternoon out. 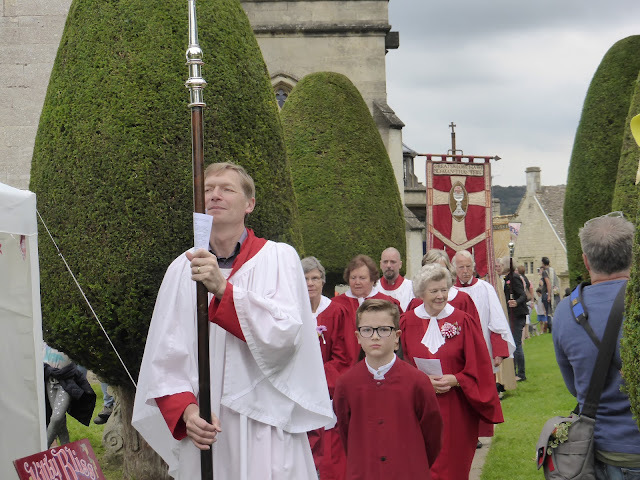 Now combined with the annual Painswick Feast - which takes place among the 99 perfectly-trimmed churchyard yew trees - the clypping itself takes its name from the old English for embracing, and is quite literally an embracing of the church. The ancient open air service sees attendees surround the church, linking hands and doing an approximation of the hokey-cokey whilst singing a special clypping hymn. Like all the best traditions, there is music, a procession and vernacular food. 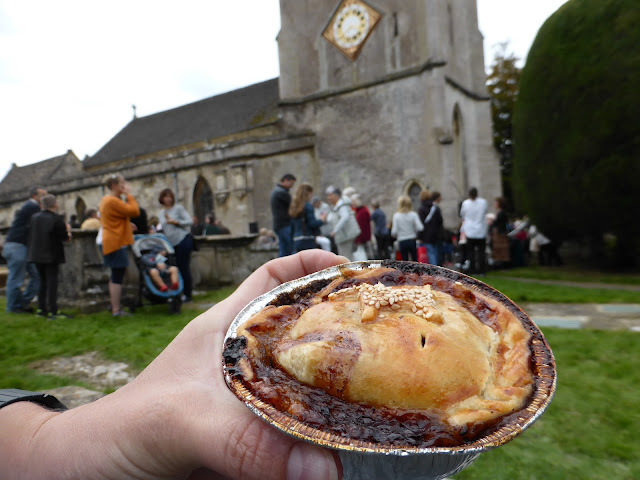 The food in question is Puppy Dog Pie, a pie now made with shin of beef and prunes which legend has it took its name from historically poor Painswick-ites who served up stray dog pies to unsuspecting visitors from nearby Stroud. All in all, a pleasantly diverting day out. As summer turns to autumn it's nice to make the most of being outside, and your author supposes that this is what inspired the earliest clyppers. Perhaps surprisingly, the highest road pass in Wales is less than two miles from the English border, a short drive south west of Hay-on-Wye. 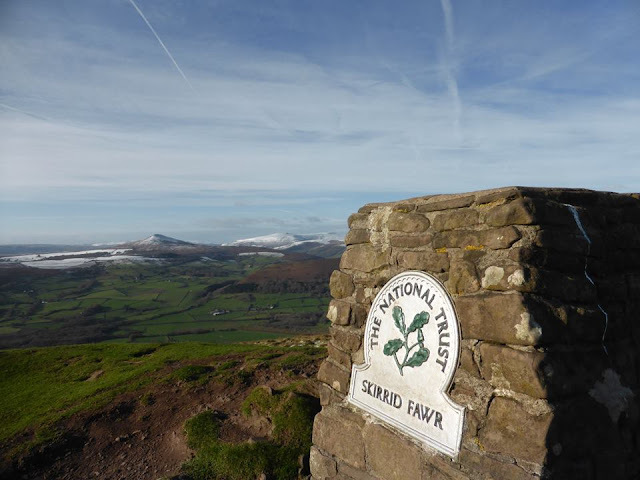 The single track road initially rises gently from from Hay to before steepening towards an altitude more than 540 metres (1,801 ft) at the point that it passes between Hay Bluff and the poetically-named Lord Hereford's Knob (pictured) in the Black Mountains. From here, the road drops towards the pretty little Chapel of St Mary at Capel-y-ffin and the former Augustinian priory at Llanthony. Local folklore has it that the pass draws its intriguing name either from the 12th century Crusaders who passed through it preaching and raising funds on the way to the Holy Land or - rather less believably - from the time that St Peter and St Paul crossed it to meet Claudia, daughter of the Welsh chieftan Caradog, who asked them to convert the Silurians living in the area to the north of the mountains. Today, the pass is popular with cyclists, walkers and those seeking a break from the bookshops of Hay. Up a rough track, through a field, over a bridge and through a gate, your author finds Ellie Crossley - the first female warden of the Chillingham wild cattle - waiting patiently in her shed. 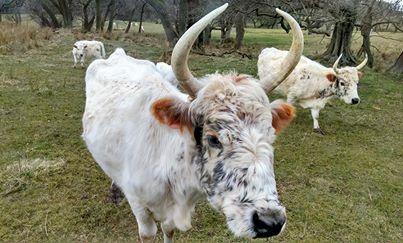 From Easter to October, Ellie offers the chance to meet the Chillingham wild cattle, England's last herd of wild cows who have lived separately from the rest of the world in a secret park in the Northumberland hills for 800 years. Once owned by the lords of Chillingham Castle - still standing just a few field away - the cattle are now in the care of the Chillingham Wild Cattle Association, and the only way to see them is via one of Ellie's regular £8 safaris, either on foot or in a tiny off-roader. The visits occasionally offer the chance to watch a real bullfight or see a newborn calf, but your author was just as content to watch these great beasts scratching off their winter coats and happily munching grass on a spring morning, just as they have been doing for centuries. The herd has lived and died in these fields with minimal interference from humans - save the odd Victorian shooting party - since the 1300s. Calves are freeborn without the help of their keepers and they undergo no veterinary procedures. It's amazing to think that these animals have managed to survive in isolation from the herds of domestic cows who roam the rest of England's millions of acres of cattle pasture for so long. 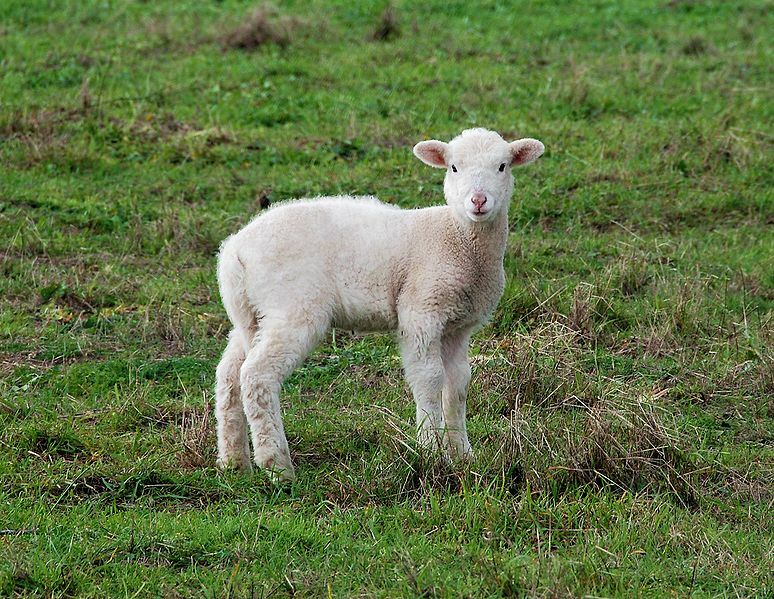 As spring finally begins to arrive, trees but, lambs skip in the fields and this year an early Easter races towards us. It's time to get out and about and see what the season has to offer. Once a year, more than sixty brass bands - including those of Black Dyke, Brighouse and Rastrick, Grimethorpe Colliery, Rothwell - gather together to compete for the the honour of representing Yorkshire in the hotly contested National Brass Band Championships of Great Britain. 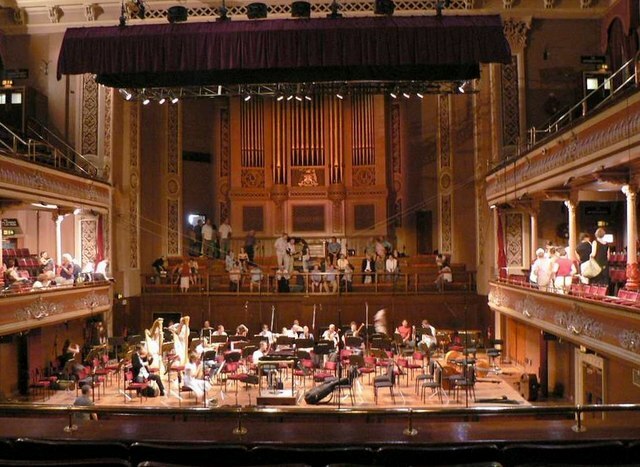 This year's competition takes place over the weekend of the 5th & 6th March at St George's Hall in Bradford, a Grade II* listed Victorian concert hall which is set to close at the end of the month for a potential £3.2 million refurbishment project. Celebrate the national day of Cornwall - and the patron saint of tinners - which regularly provokes special events in Bodmin, Bude, Callington, Camborne, Falmouth, Marazion, Newquay and Porthleven, where the Old Cornwall Society holds an annual Flag Raising. In what sounds like a dream for some and a nightmare for others, St Fagans National History Museum offers the chance to spend a full day with a shepherd called Emma in a lambing shed at Llwyn-yr-eos Farm, learning how to care for pregnant sheep, with the possibility of getting hands on with delivery. The 13th The Annual Niel Gow Festival takes place in the Perthshire town of Dunkeld & Birnam, and honours the famous 18th century Scottish fiddler and dancie Niel Gow, who was born in Inver on the south side of the Tay. 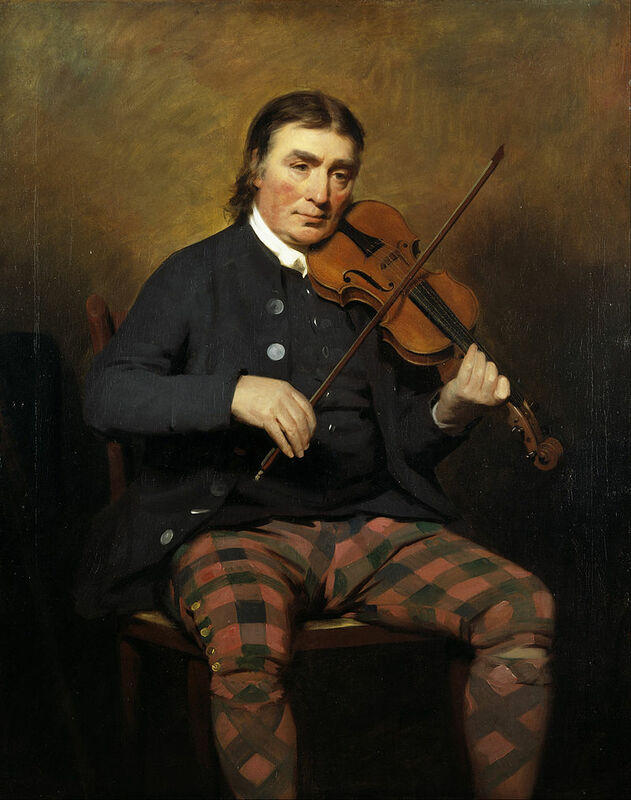 The event aims to celebrate the life and music of the Perthshire's fiddle legend, as well as raise enough funds to erect a fitting memorial to the man himself. The Observatory Science Centre at Herstmonceux Castle in East Sussex was the home of the Royal Observatory from the 1950s until 1990, when the Observatory moved to Cambridge. 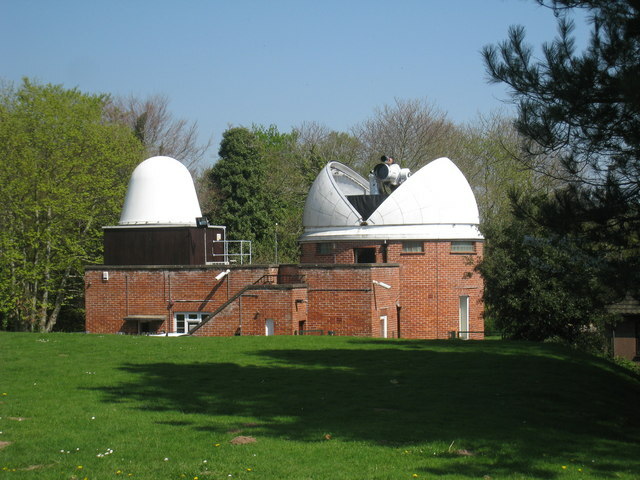 Part of the site has now become the Bader International Study Centre of Queen's University in Canada, and the other bit is now the Observatory Science Centre, an interactive hands-on science centre for families, which hosts regular stargazing evenings. When you go skiing in Scotland, you always take a bit of a gamble with the weather, and last weekend's jaunt demonstrated that very well. Originally, your author had planned to mark the 60th anniversary of Glencoe ski area with some skiing there. However, come Saturday morning a small party was hauled up in a cafe on the outskirts of Glasgow with heads cloudy from the previous night's festivities, to find that Glencoe was closed due to high winds. The result was a last-minute dash to Glenshee in the Cairngorms National Park for some very windy skiing. 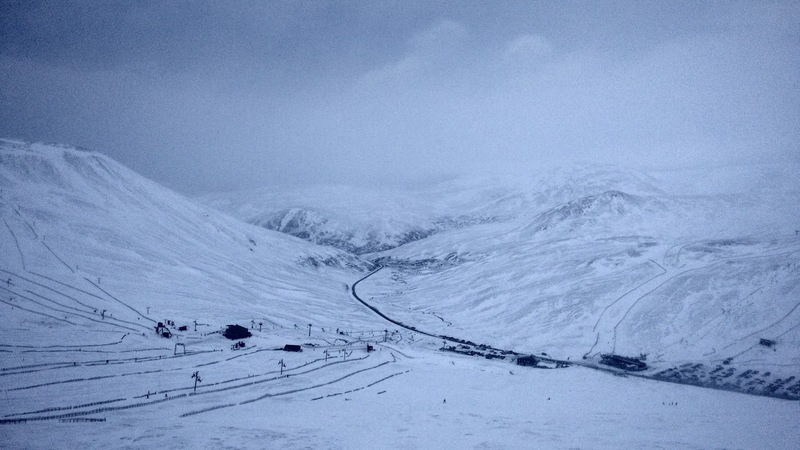 As far as British skiing goes, Glenshee is about the best we have to offer. It's our largest resort, with with 21 lifts over 4 mountains and 3 valleys, and they've been skiing here since at least the 1930s, with the first rope tows installed in 1957, with even a chairlift as early as 1962. However, last weekend visibility was low, the wind was very cold and at one point your author planted his face in a bank of snow rather hard. It was rather a shame for those there last weekend that the week before and the week after witnessed clear blue skies, but the runs were open and in places the snow was very good. Plus, there was one room left at the excellent Braemar Hostel, a functional dinner and ale was on offer at the Invercauld Arms and the Moorfield House Hotel in Braemar had a fire and some good whisky to warm the group up again. And anyway, skiing on the continent often has its bad weekends. 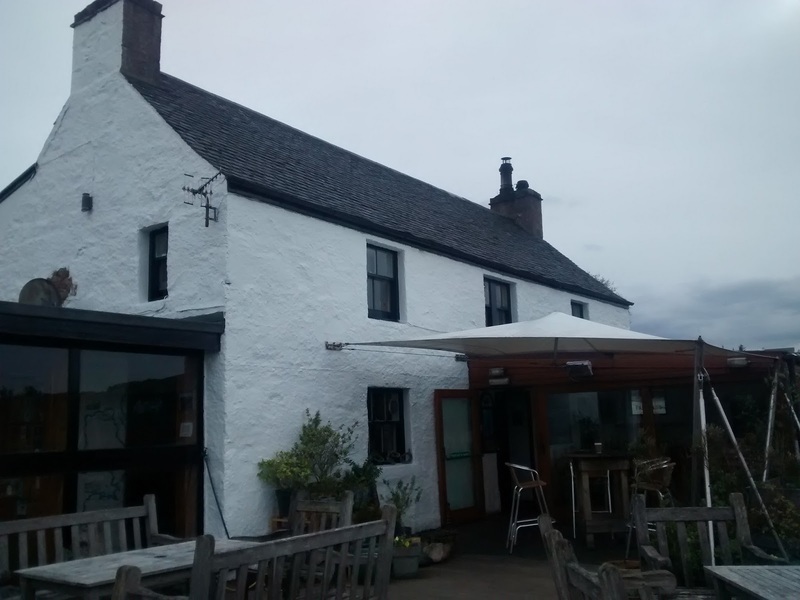 A good feed on Friday was had at Stravaigin in Glasgow's West End, the drive between Glenshee and Glasgow Airport took less than two and a half hours, and car hire is very reasonable. Ski pass and hire cost around £50 a day and the whole trip cost more than your author cares to remember. The shortest month at the tail end of winter, February often gets overlooked by those organising interesting events, as commercial imperatives focus the mind on Valentine's Day mid-month, from which cash usually flows. Nevertheless, there are some good things to see and do for those willing to travel. A selection are reproduced below. A village tradition dating back to at least 1445, the Olney Pancake Race was revived in 1948 by Reverend Canon Ronald Collins, the Vicar of Olney. Legend has it that the race began when a local housewife - busy cooking pancakes in anticipation of the beginning of Lent - heard the Shrove Tuesday "Shriving Bell" pealing from the Church of St Peter and St Paul and ran to church, still with her pancake pan in hand. London welcomes the Year of the Monkey on Sunday 14th February, with music, dance, food and drink from 10am in Trafalgar Square, on Wardour & Gerrard Streets and on Shaftesbury Avenue, with highlights including Szechuan Opera and a monkey-themed finale with fireworks and projection on Nelson’s Column. Vikings return to York for the annual festival of fighting, shouting, lectures, guided walks and battle re-enactments which attracts around 40,000 visitors to the city during February-half-term, the ancient moment when young Viking warriors got a week off school to spend time with their grandparents. The finale takes place on 20th February and sees the Castle Green become thr fiery battleground the infamous Battle of Assundun. Music, workshops, storytelling and sessions for a weekend the Holly Bush in Alcester, a Warwickshire market town famous for its Roman history. The pub was taken over last year by Nigel Smith, who supplies bars to the Bromyard and Warwick Folk Festivals, making it a great place for Folk. It's snowdrop season, and Visit Scotland have gathered together nearly 60 events where you can go and gawp at white flowers on a background of green, all around he country at castles, botanical gardens and observatories. 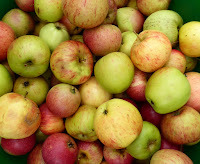 There will be a good cider apple harvest in Surrey this year. Your author has made sure of it. 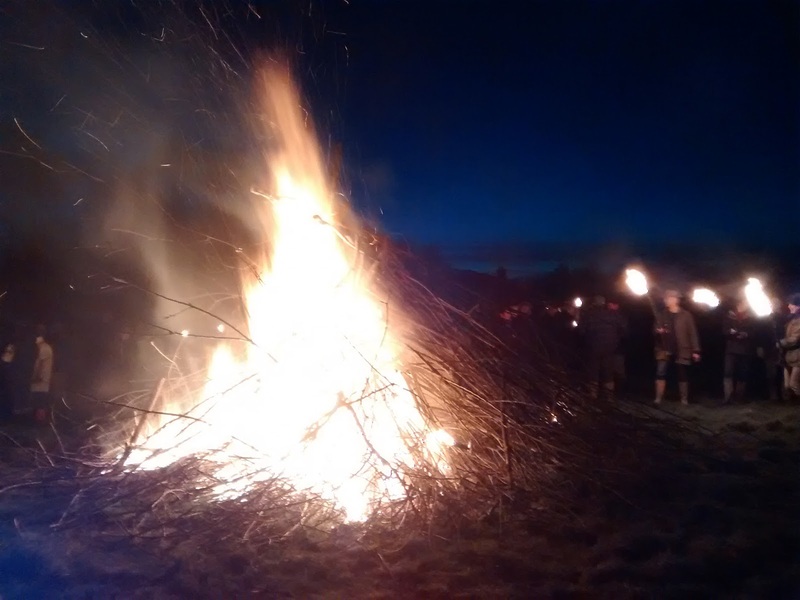 On 16th January, a small group of friends made their second pilgrimage to join locals in Outwood village in the Surrey Weald and Rampant Rooster Morris from nearby Dorking for the Outwood Wassail, a blessing of the orchard through fire, song and dance. Wassailing is a pre-Christian tradition which aims to wake the trees from their wintry slumber, and drive away evil spirits which may threaten the next year's apple harvest. 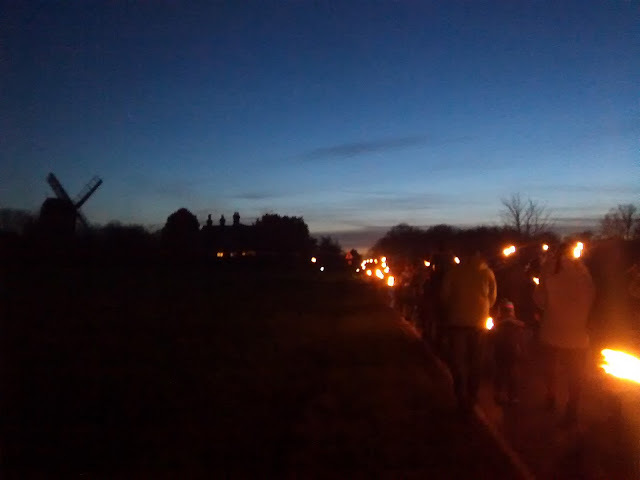 After nourishment, a jar of ale, and a chance to watch Rampant Rooster outside the 17th century Bell Inn at Outwood, those present were handed a piece of fire and set off en masse uphill past the beacon towards Outwood Mill. Behind the Mill is a small orchard, and there mulled cider and apple juice were enjoyed around the bonfire before everyone was offered the chance to drink from the Wassail bowl. As a result,there will be apples again this year in Surrey. When you learn that the Bush Inn at Crosstown in Morwenstow, north Cornwall, has been licensed since the 13th Century - with a history stretching back to 950AD - it might seem surprising. However, when you step through the door after the long drive along winding lanes to be greeted by friendly faces and a fire smouldering in the grate you realise not a lot has changed in this corner of rural England. 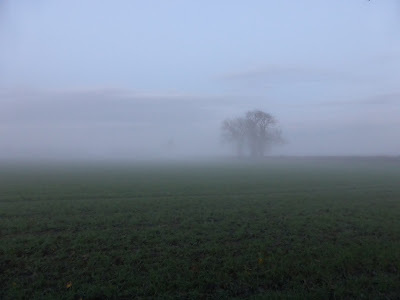 The only difference is you are more likely to meet a friendly local farmer than one of the wreckers who used to haunt these wilder parts of the west of England. Today, the Fletcher family are doing a great job in welcoming all comers to Crosstown, with great food, bed and breakfast and self catering breaks on offer, and walks from the door out towards the South West Coast Path. 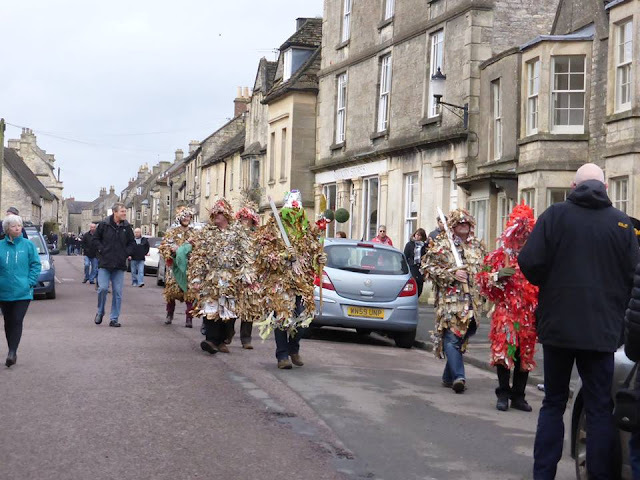 Mummers Plays have been popular in the Cotswolds broadly since the medieval period, and though it has seen ebbs, flows and revivals, this intriguing form of traditional folk drama never quite died away. 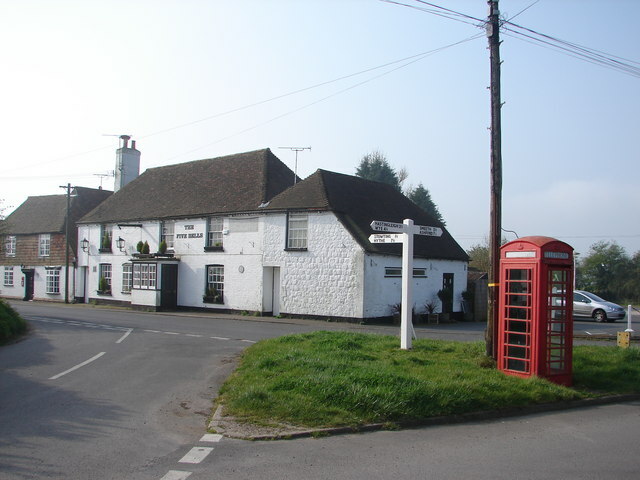 Distinctive village plays once toured from house to house and pub to pub in England, and even sometimes Scotland and Wales, and they still remains popular in some corners. Your author very much enjoyed his second trip to watch the Marshfield Mummers on Boxing Day and is disappointed to be missing this weekend's International Mummers Unconvention in that best of all towns, Stroud in Gloucestershire. The event will see Stroud filled with Mummers, with a symposium and keynote speech today followed by a fitting trip to the pub, in this case the Prince Albert in Rodborough. Then tomorrow sees the town full of Mummers, with plays in the streets, wassails in the town centre and at the Museum in the Park, a procession, and Twelfth Night revelry at the Subscription Rooms. Since the puritanical Scottish Government's draconian new driving laws kicked in a little over a year ago, the life of the Highland publican has gone from "very difficult" to "virtually impossible to sustain" and so it is that many of your author's favourite rural drinking spots have either closed or been put up for sale. One such pub is the wonderful Badachro Inn found on the banks of Loch Gairloch in Wester Ross, with views over the water to Eilean Horrisdale. 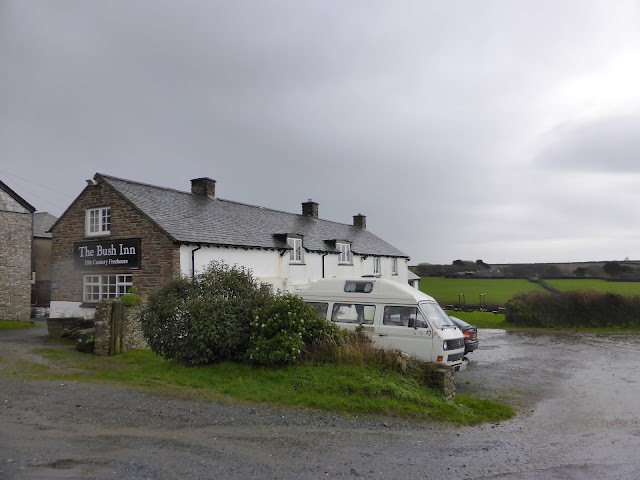 It was only a year or so that the equally-brilliant Melvaig Inn, ten miles or so to the north closed down, and whilst hopefully someone will take on the Badachro, times are hard for the pub with no rooms in these parts of Scotland, even if some of your clientèle arrive by yacht. When you're trading in what was once an area of fishermen and crofters, now popular with seasonal second homers things are even harder, but with a stunning position like the Badachro, a reputation for great food, free moorings for customers, lobsters, crabs and prawns still landed nearby and available for cooking and a fine interior, hopefully someone will be able to find the nearly-half-a-million quid needed to keep this lovely pub alive. Legend has it variously that the hill known as Skirrid in Monmouthshire was blown apart by a bolt of lightning at the moment of Jesus Christ's Crucifixion, or that an angry Devil stamped it in two to spite St Michael. It is, of course, impossible to disprove either, and whilst the geology of the hill known in Welsh as Ysgyryd - or 'divided hill'- reflects the myths, it seems more likely that its two humps were separated during the Ice Age. Having said all that, the mysterious air which surrounds the hill means nothing should be discounted. 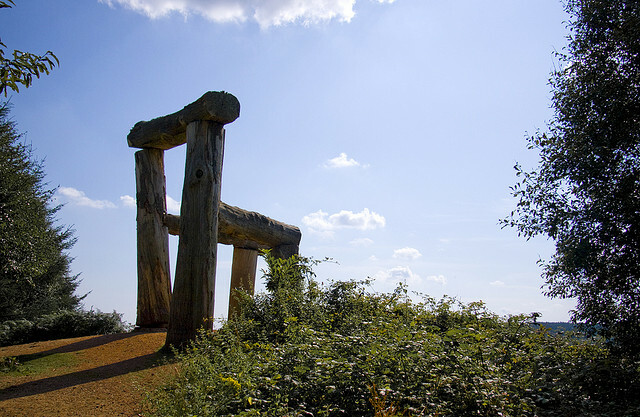 The hill was used as a hill fort during the Iron Age, with those inside feeling great security thanks to the panoramic views from the top, and there was also once a church dedicated to St Michael near the summit, of which evidence can still be seen today. The hill is also known locally as the Holy Mountain or Sacred Hill, and the short pull to the top is pleasant enough, even in as much wind as when your author visited recently. 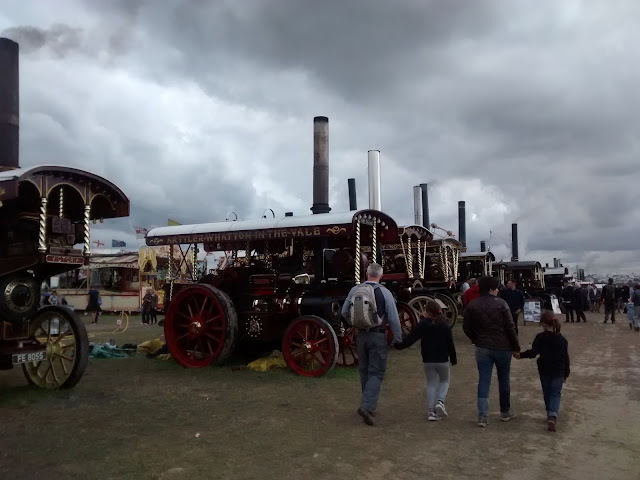 Yesterday, your author was lucky enough to spend the day at the Great Dorset Steam Fair at Tarrant Hinton, near Blandford Forum. The event is a gathering of traction engines, tractors and vestiges of historic life in rural England which is now in its 47th year. As the double decker bus bounced over the hill and the Fair came into sight, the feeling of excitement was much the same as was felt some 16 years ago when first arriving at Glastonbury Festival, with almost as much to see and do. Today is the last day, but the sun is shining and if you leave now you could still get there. Any show which holds the Guinness World Record for the largest parade of steam rollers, where you can pick up a new handle for your garden spade for just £4 and where you can watch historic earth-moving equipment demonstrating how to build a new stretch of road is as remarkable as it is not for everyone. However, those who do embrace it have the time of their lives, with cider of unknown percentages served in ex-military tents, miniature traction engines, horse ploughing demonstrations and the chance to take a picture with a mock-up of the late Fred Dibnah all experiences on offer on site. Once local farm labourers, watermen and shipwrights could find hospitality in more than 15 inns in the village of Brockweir, a sleepy little place on the eastern banks of the River Wye which was once an industrial port where goods were transferred from seagoing boats onto river barges to continue upstream. Today, the demise of The Ship, The Severn Trow, The Bristol, The Spout and The Royal Arms mean that only one remains, but it certainly makes up for it with bags of charm. The Brockweir Inn stands proudly on a corner close to both Brockweir's Victorian Moravian Church and the iron road bridge which was opened in 1906 to finally allow residents to visit their neighbours on the other side of the Wye without getting a ferry. The Brockweir Inn was known as the George Inn in 1793, and had become the New Inn by 1840, before taking its current name around 1994, perhaps because all the competition had died off. Inside, two cosy bars - one with a fire and another with a wood burner - offer a pleasant place for a meal, or a local ale, including regular brews from the Kingstone Brewery, a mile down the road in Tintern. There is also a nice garden bit at the back and an inspirational Community & Visitor Reading & Games Room upstairs, supported by the Pub is the Hub campaign. 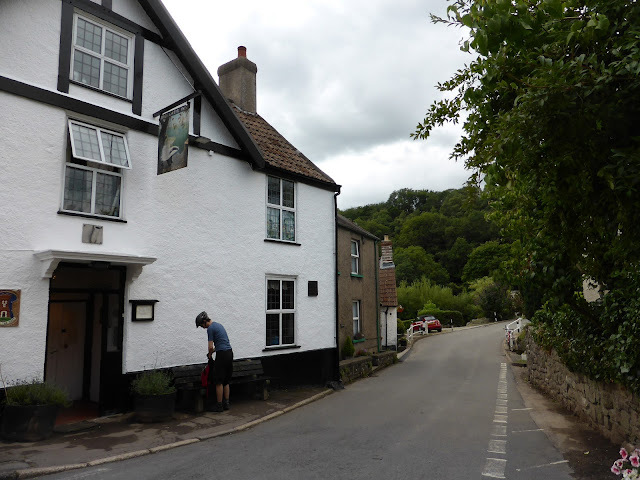 When your author dropped in on a recent bike ride it appeared to be thriving, with reasonably-priced and tasty sandwiches and half-pints of Wye Valley Ale providing the sustenance needed to continue southward. The longest-running sitcom in the world was filmed in the West Yorkshire town of Holmfirth for 37 years until 2010, and told the story of three old boys with a penchant for sexually assaulting ladies with wrinkly tights, and going down hills in a bath. Today, the picturesque town thankfully has more to trade on than its association with Compo, Clegg and Foggy, but some last metaphorical sediment remains from the Last of the Summer Wine. 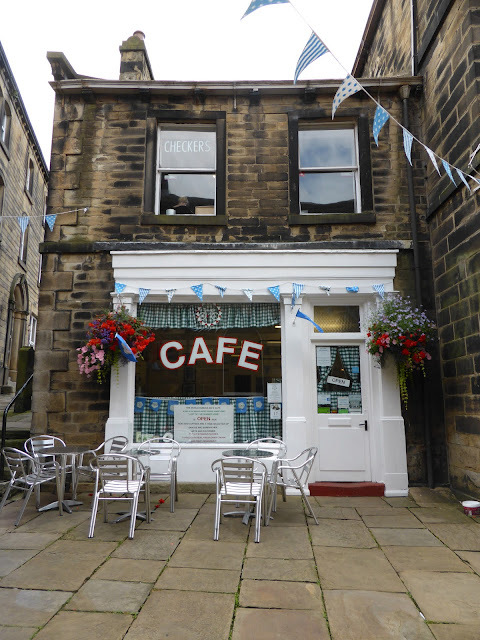 When the BBC crews first showed up in 1973, the building that was to be immortalised as Sid's Cafe was a former fish & chip shop that was being used to store paint, but now it is an honest caff famous for its green gingham curtains and Yorkshire Tea. Thankfully, in this part of the country tea drinkers will not settle for sky-high prices just because a place has a brush with fame and when your author dropped in on Yorkshire Day a week or so ago, a cup of tea was still less than a pound, the most expensive thing on the menu was only a fiver and every purchase came with a free box of Yorkshire Tea. 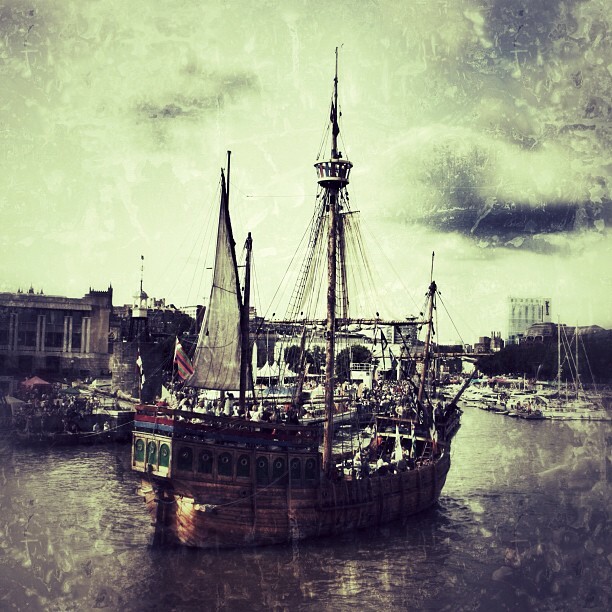 The free Bristol Harbour Festival kicks off today, and continues all weekend, with music, arts, circus, dance, boats, food and drink and plenty of other things to do from now until Sunday. Some of the acts playing over the weekend include reggae legend Dawn Penn, Asian dance act Swami, folk-rockers Roving Crows, alt-folk and country outfit Cardboard Fox and Zanzibar’s live wire singer Mim Suleiman. As well as the music, plenty of events will take place on the harbour itself, including a chance to try the UK's fastest growing watersport, stand up paddleboarding – games of Massive Battleships, and trips on one of the M Shed museum's historic boats. 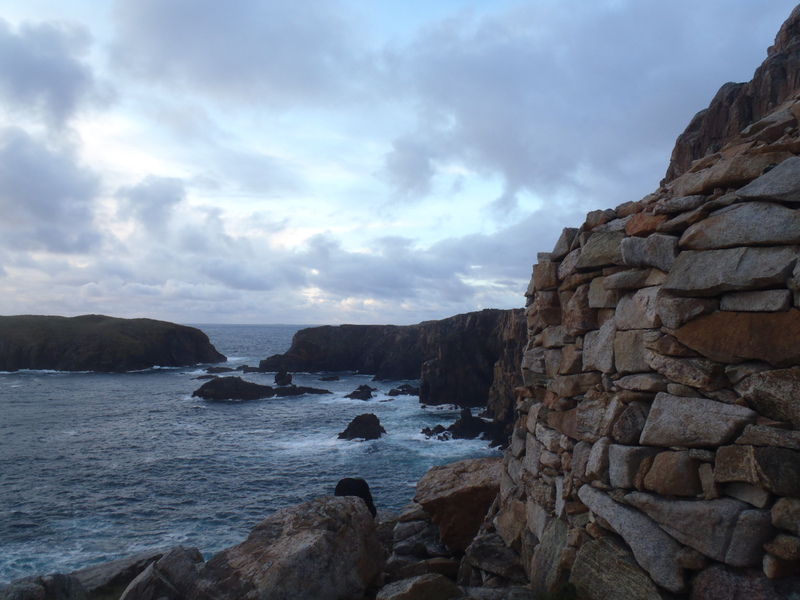 There is possibly be no more exhilarating experience in the British Isles that gazing out into the Atlantic from high on the sea cliffs close to the tiny hamlet of Mangersta, near Uig on Isle of Lewis, such is the rawness of the location. 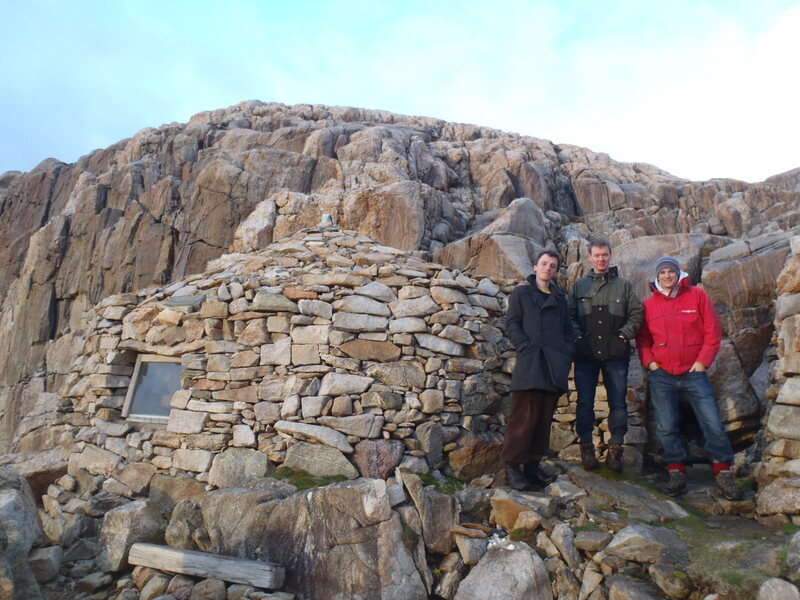 Your author was drawn to the spot by word of a wild stone bothy built among the boulders on the cliffs by John and Lorna Norgrove, who run the Linda Norgrove Foundation from the islands. Almost invisible for those without a guide, the bothy provides a lonely dot of man-made beauty on the wild and rugged stretch of cliffs, in one of the most sparsely populated corners of the British Isles, and even occasionally offers views towards the Flannan Isles and St Kilda, and beyond to Iceland and Greenland. When as a youthful undergraduate your author struggled with a taxing piece of work or needed inspiration for a difficult essay, the best solution always seemed to be to go for a wander around York Minster. For even the most cynical visitor would fail to find the Minster interesting, dominating the skyline of the historic city of York, and though your author is Godless the fact that nearly a thousand years ago people could manage to build such a huge and beautiful place for someone or something they had never seen and couldn't be sure existed helped to see that the minor trials of higher education could easily be overcome. 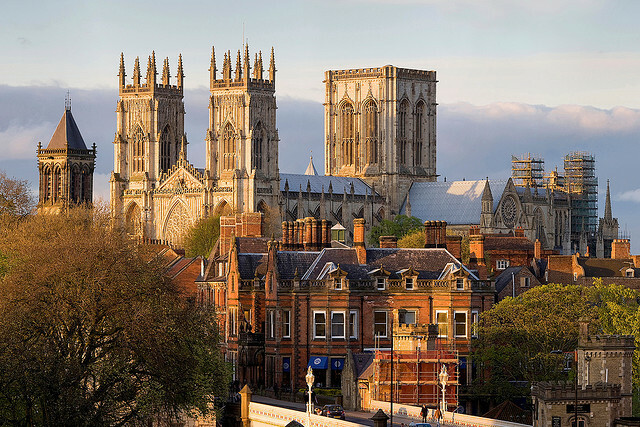 Begun in the 11th century on the site of a church that had first been constructed in wood around 627AD to baptise King Edwin of Northumbria, the Minster wasn't officially deemed complete until 1472, when it was formally consecrated. 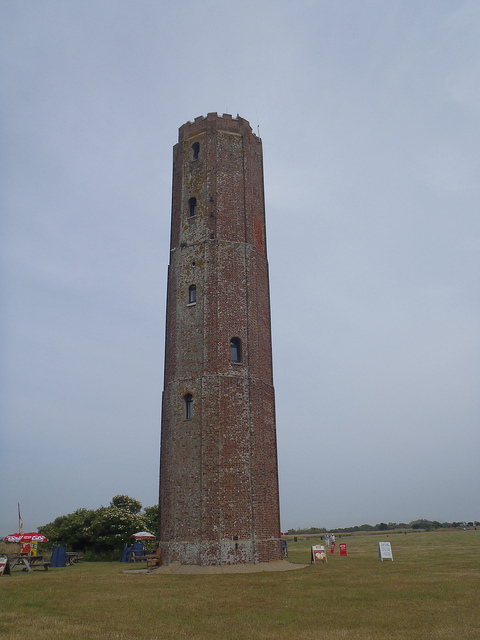 Since then, it has survived a siege of York during the Civil War, an attack by the Non-Conformist arsonist, Jonathan Martin, in 1829 and a fire in the 1980s after it was struck by lightning. It remains as inspiring as it always has been. 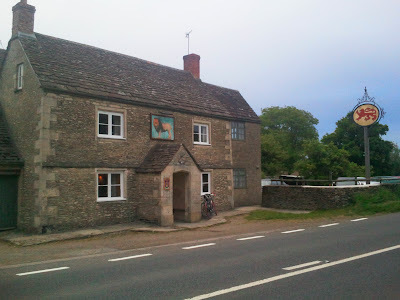 Yes it's another pub - this time in the wilds of North Somerset - but the George Inn in Norton St Philip is worthy of mention for so much more than being a simple pub. One of so many that claim to be England's oldest your author has stopped counting, it was probably built in the 14th century, originally as a wool store and inn for travellers in a village that held annual wool fairs, with a license to sell alcohol as early as 1397. 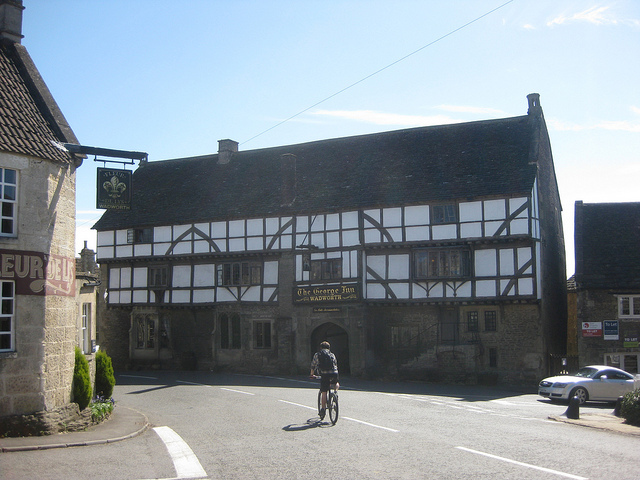 Quite apart from its history, the George is a beautiful building and arriving by bicycle downhill from Hinton Charterhouse it is a sight for sore eyes. It's staying power as a village pub in an age where people would seemingly often rather stare at a screen in the corner of a room while mindlessly necking cans of cheap larger than have an interesting conversation with friends in a fascinating place is evidenced by the presence of another across the road and as a result it seems like a particularly fine place to stay the night, as others have before, for this was once an important stagecoach route used by the likes of Samuel Pepys. It's good to have a break every now and again, and for the next week for the third Easter in a row your author is off to various islands off the coast of Scotland - possibly for the last time before it votes to leave the Union - for some fine landscapes and interesting places. 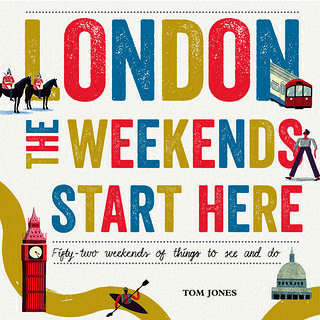 As such, a brief break in things to do in London will be enforced until at least next weekend. 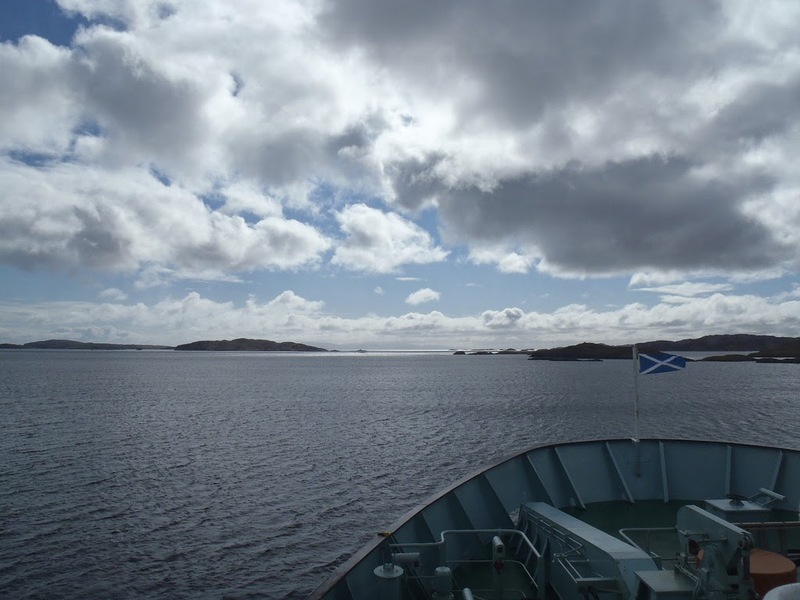 If you are seeking inspiration, you might consider planning your own Scottish trip, taking in some islands, some pubs, and some big landscapes. A perfectly formed 1970s Modernist house in the Devon hills just outside Barnstaple, the Anderton House designed by Peter Aldington of Aldington & Craig for Ian and May Anderton in the 1970s. Now in the care of the Landmark Trust, the house differs from many of the other houses in the Trust's care, which tend to be older, but is recognised for its architectural merit, which has earned it Grade II* Listed status. 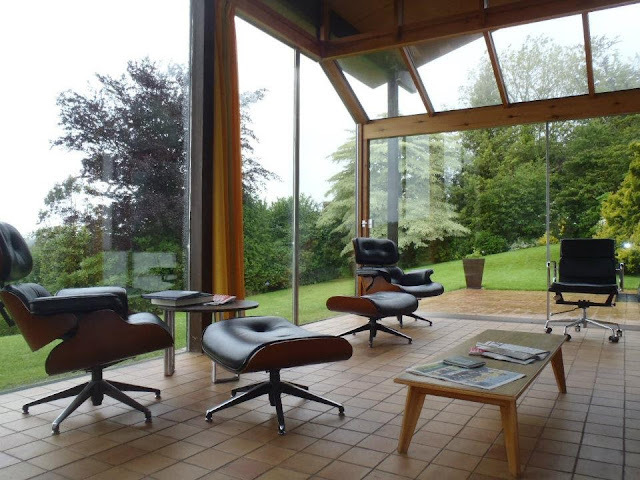 The house was designed to make the most of the views across the valley, and to allow Ian Anderton to work close to his family without them having to put up with his clutter of papers. 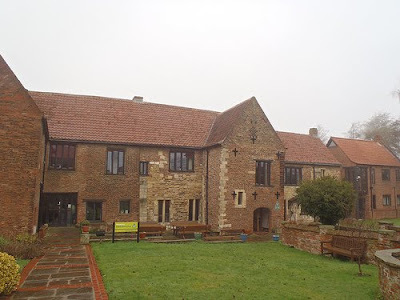 Staying here really helps to see how Aldington made this work, with the large glass windows doing a fine job of keeping the rain out when your author visited for a family birthday. The annual Fringe Festival in the South Cotswold town of Stroud began yesterday and continues all weekend, offering a range of free entertainment in pubs, cafes and streets around town and in the main stage in Bank Gardens. 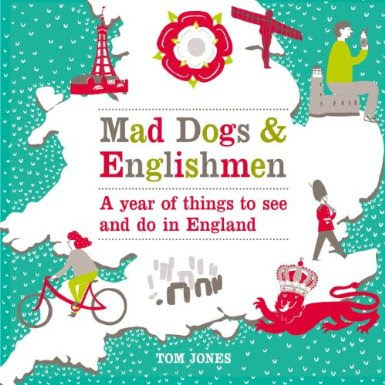 For the first time in many years your author will not be attending due to a wedding in Worcestershire, but the Festival promises as always to be a good one. The Festival has grown and shrunk and grown again over the years since it began in the 1990s, but offers some very pleasant entertainment from a range of bands that very few people have ever heard of. 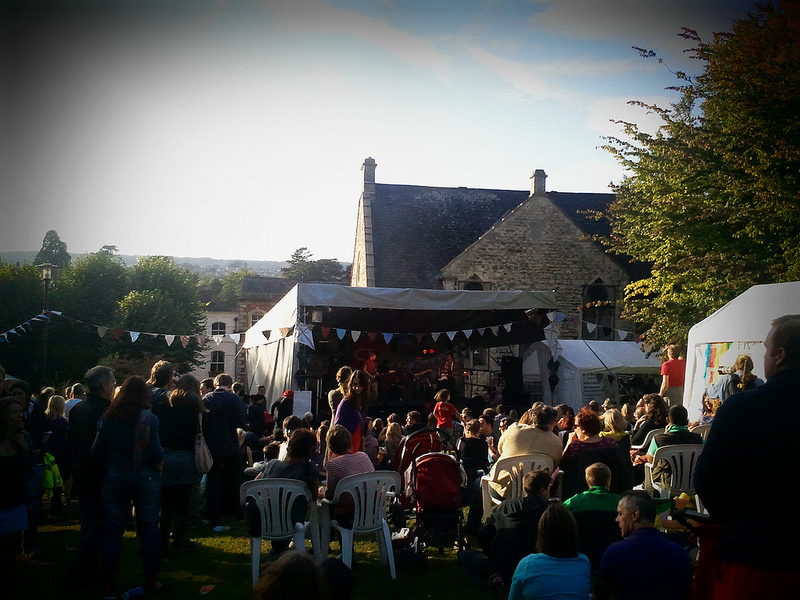 Nevertheless it's this small town at its best and brings out a local crowd and many from further afield to enjoy the entertainment. 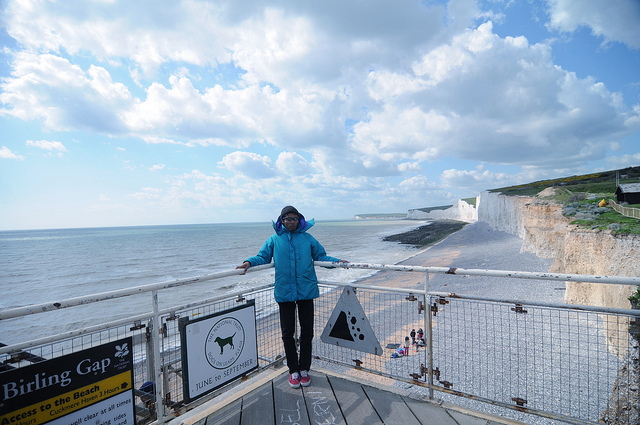 The ladder at the tiny hamlet of Birling Gap, with its 19th century coastguard cottages, offers a rare chance to access the beach among the world famous Seven Sisters chalk cliffs, which rise to a peak at Beachy Head. Where once there was a rickety ladder, and later stairs now there is a new and improved metal staircase which makes the beach accessible for most able-bodied people. When your author last visited, he walked from Eastbourne over Beachy Head - with a late lunch at the Beachy Head Pub - and then had an evening drink at the Birling Gap Hotel before catching a taxi back to the station. 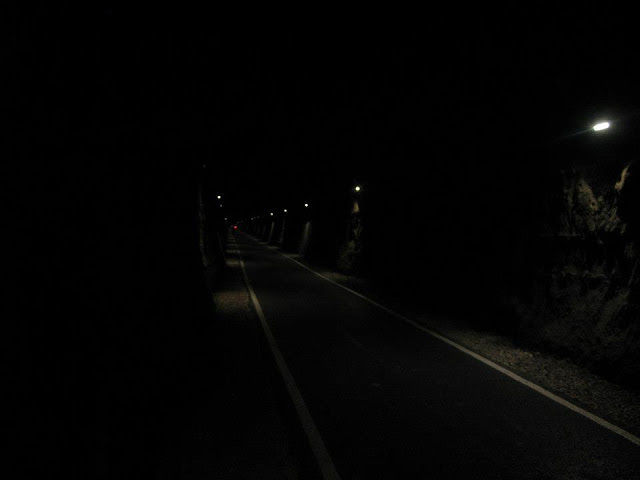 As a walk, it is highly recommended. An award-winning art gallery in Eastbourne, Sussex, the Towner originally opened in 1923, and in 2009 relocated to its current premises attached to the Congress Theatre in Devonshire Park, where it maintains a rolling programme of great arts for a town with a population of nearly 100,000 people, as well as many tourists and visitors. The Towner's collection includes works by Tacita Dean, Henry Moore, Pablo Picasso, Eric Ravilious, Eric Slater, Alfred Wallis and the British painter with the best name in the business, Thomas Jones. 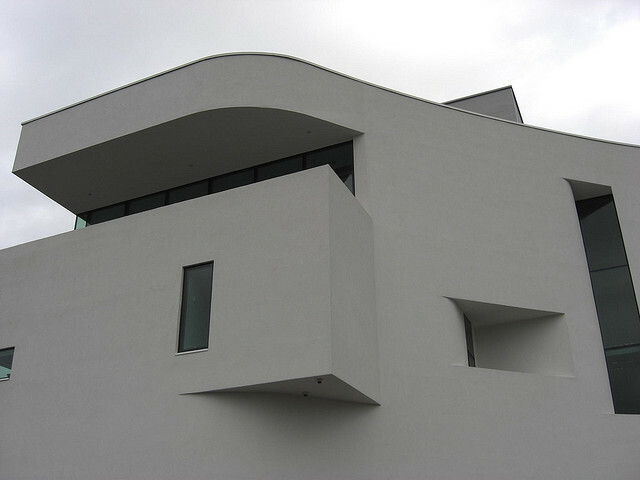 Nowadays, some say it's part of a 'ring of pearls' of South Coast art galleries that includes the Jerwood at Hastings, the De La Warr Pavilion at Bexhill and the Turner Contemporary at Margate. 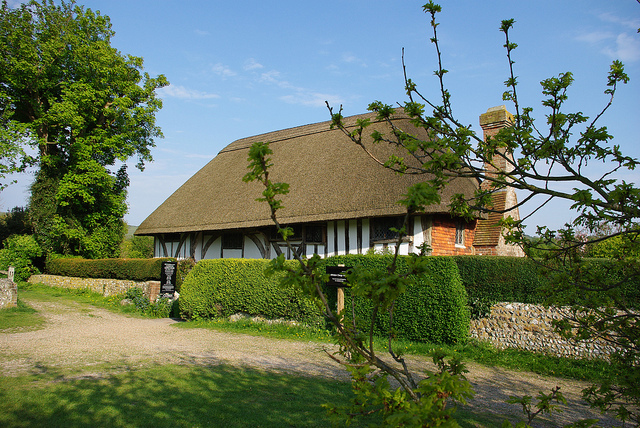 The very first building acquired by the then-newly-formed National Trust in 1896, Alfriston Clergy House was built as a farmhouse in the 14th century, and was later used as a convenient home for the parish priest, situated beside the parish church on the village green. It's a peaceful spot, and whilst the house is very interesting the garden is the real pleasure of the place, offering a pleasant setting to soak up what remains of the summer sunshine, whilst considering the work of those who built a charity to care for such interesting places, and the volunteers who keep them open today. 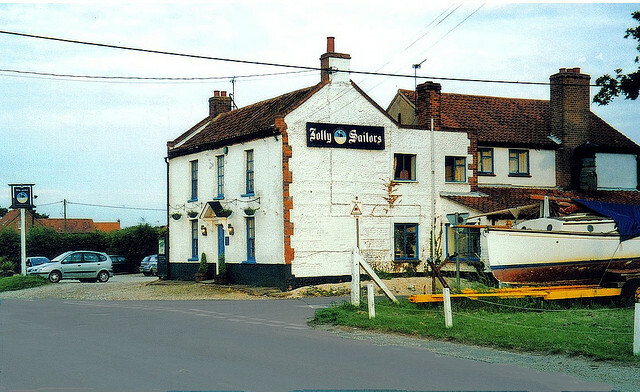 An attractive 16th century pub close to the Pilgrims Way - a route that once took travellers by foot to London, Canterbury, Dover and the Continent - The Five Bells Inn is now also on the North Downs Way, a modern walking route that here follows the line of the Downs towards Folkestone & Dover. Though it has an up-to-date feel inside it is not at the loss of it being a friendly local pub, with woodsmoke in the air when your author last visited and fresh food for sale from the kitchen and also in the form of the in house village shop, as well as added extras necessary to make a pub profitable nowadays like breakfast brunch and morning coffee, tea and cake. A decent little pub in the upmarket North Norfolk village of Brancaster Staithe, built in the 18th century and still popular with locals and visitors, especially due to its attached brewery which produces ales such as Brancaster Best, Malthouse Bitter - named after one of the country's largest malthouses which stood in the village from the 18th century onwards, built from Roman bricks - Oystercatcher and The Wreck from local ingredients. When your author visited for a beautiful wedding last month at nearby St Mary's Church, Burnham Deepdale - known for its Saxon Round Tower, its Norman Font and its Medieval Glass - he managed to sneak in two trips to the Jolly Sailors in 24 hours, and was even lucky enough to stumble across the pub's 4th Norfolk Ale and Music Festival. 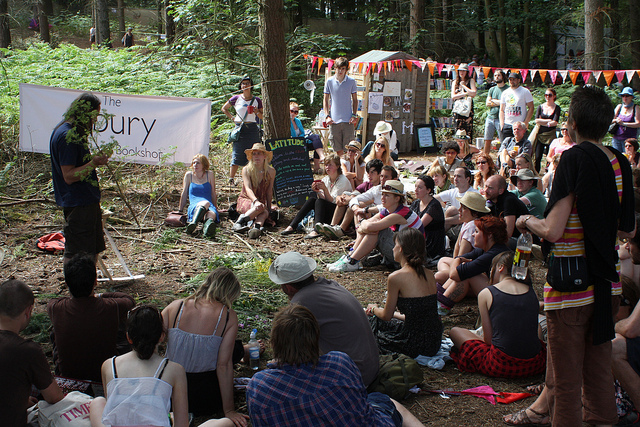 Your author is off to Latitude Festival this weekend with Ebury publishing to talk about books and that sort of thing. 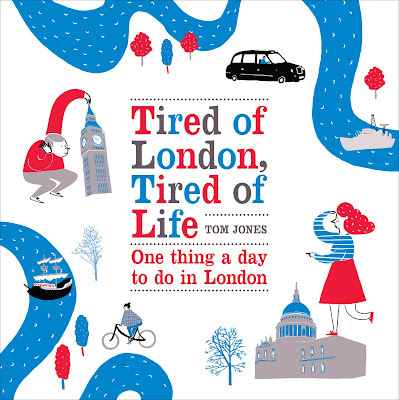 Indeed, if you're interested there will be a talk based around the new book at 1.30pm on Sunday in the Ebury Library and Bookshop. The whole festival looks like a decent combination of bands, arts, theatre and people talking about funny and interesting things, and it will hopefully be good fun. 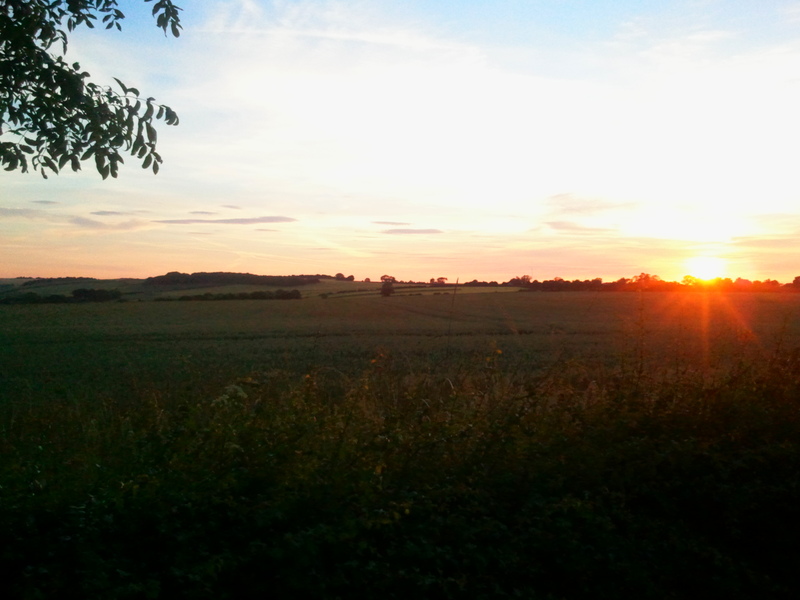 Your author spent a very peaceful night yesterday at Woody's Top Hostel, a remote former barn in a beautiful area of the Lincolnshire Wolds near Louth which has been run by the Youth Hostels Association since 1948. We are told that the hostel's name is derived from "Mr Wood's Top Barn", and it certainly has a remote barn feel about it, surrounded by fields of swaying barley and offering beautiful sunsets over the rolling hills. The Lincolnshire Wolds is an underrated area of the country, and as many make their way to seaside resorts such as Skegness and Cleethorpes, or RSPB reserves at the coast, they would do well to stop and explore this line of hills which is a designated Area of Outstanding Natural Beauty. 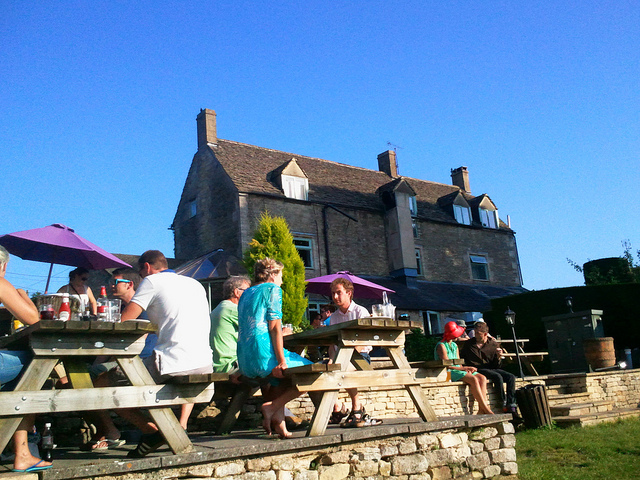 Your author was out in Gloucestershire this weekend, for a pub cycle around the South Cotswolds. The participating cyclists arrived just in time for dinner at a great little pub which has always been a favourite, and benefits from fine views across the green valley towards Woodchester Park, owned by the National Trust. Originally built as two weavers cottages, we are told that the building has been a pub for more than 250 years, and maintains an exterior of beautiful Cotswold stone, with plenty of room inside and out for drinkers and diners. One of two licensed premises in the village, it was busy when your author popped in, with plenty of customers and even the local MP dining quietly with a group. The Red Lion in Ampney St Peter in Gloucestershire is a beautiful 300-year-old Grade II listed pub constructed in beautiful Cotswold Stone. The real highlight is the interior of the pub, which is listed in The Campaign for Real Ale's National Inventory of Historic Pub Interiors, based around two small rooms and no bar, one of a tiny handful of pubs left in the the country without a proper bar. It's timeless atmosphere is further enhanced, we are told, by the fact that the current landlord is fourth since 1851. 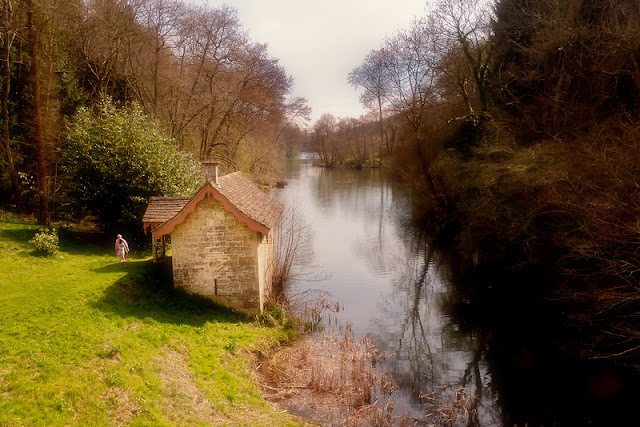 Known for its unfinished 19th century Gothic revival mansion - abandoned around 1870 by workmen who never returned - Woodchester Park can be an eerie place, not least because the high wooded sides of the valley prevent winds from penetrating too far and make for a quiet and atmospheric setting. The Park itself is maintained by the National Trust, and is open to the public, allowing visitors to wander a network of paths around the lakes, trees and fields and wonder what it might have looked like when the house was occupied during the 18th century. 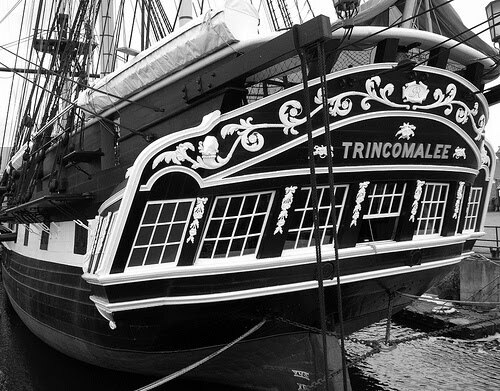 The centrepiece of Hartlepool's Maritime Experience, a themed recreation of the town in the 18th century, HMS Trincomalee was built in Bombay, India, in 1817 and is the oldest British warship still afloat, and is said to be the second oldest floating ship in the world. The boat sits in the town's Jackson Dock where she was brought in 1987 for 10 years of restoration following work as a training ship, and is now part of the National Historic Fleet, Core Collection. A truly beautiful Youth Hostel set in a 600 year old restored Dominican friary, Beverley friary sits close to the centre of the Yorkshire market town of Beverley and has been a youth hostel since the 1980s. Following a recent £340,000 refurbishment, the friary re-opened in October and the results are impressive. Whilst your author didn't meet the ghostly Dominican Friar who is said to live there he was thoroughly impressed with the amazing friary. It isn't often you get to spend a night in a place mentioned in the Canterbury Tales for a tenner, and explore your own medieval and Tudor wall paintings, high beamed ceilings and stone fireplaces. The friendly volunteer warden charged with greeting winter visitors was a particular pleasure, and the place was a fine example of the interesting buildings in which the YHA has hostels. 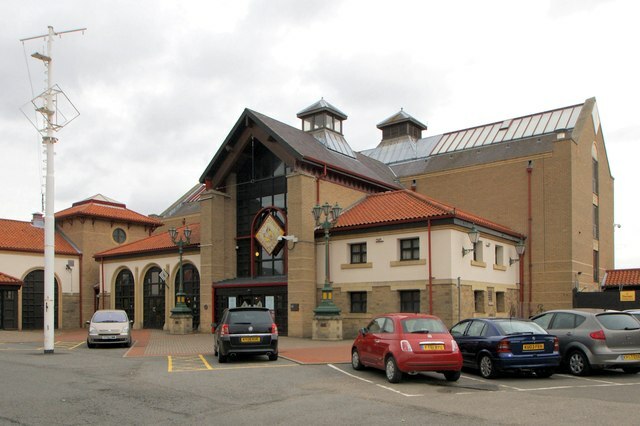 Grimsby's Fishing Heritage Centre opened at Alexandra Dock in 1991, aiming to tell the story of the town's fishing heritage, with a particular focus on what was like for trawlermen and their families in the 1950s. The Museum offers the chance to climb aboard the Ross Tiger, a 1950's trawler acquired by the town in 1992 for £1, and moored beside the museum, with other highlights based around the recreation of '50s Grimsby. 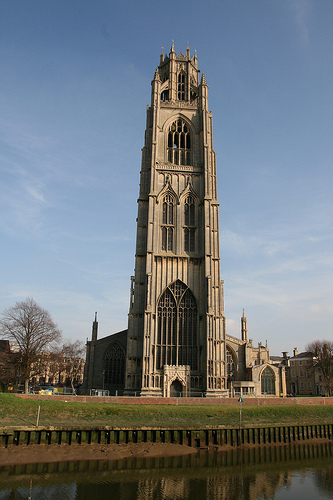 The parish church in the Lincolnshire town of Boston is one of the largest parish churches in England, known for its huge tower - visible for miles around in a particularly flat area of the Fens - which is affectionately referred to as the Boston Stump and used for navigation by everyone from 16th century farmers to Second World War bomber pilots. Construction of the church started in 1309, but the tower was not begun for another century, until 1450, with the church completed by 1510. The church is known for its library, founded in 1634 and regarded as one of the best parish libraries in the country. 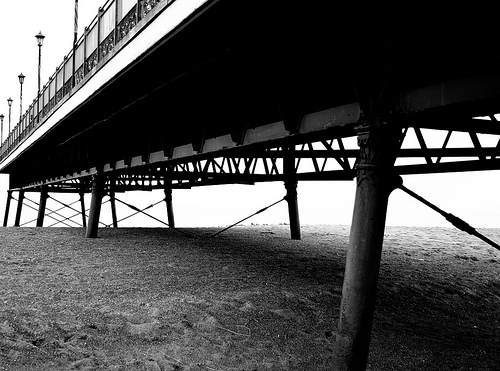 Opened in time for the summer season in 1881 and built by Head Wrightson of Stockton, Skegness Pier was designed to allow North Sea boat trips, which we are told ran as far as The Wash and Hunstanton in 1882. Despite various bumps and scrapes - from a ship in 1919, floods in 1953, demolition work in 1971 - the pier remained intact until severe gales caused damage in 1978, and further damage caused the pier to be partially dismantled in the 1980s. Whilst only 118 metres of the pier remain, it has since been refurbished and is still a popular spot for visitors.